Nations of the Horn of Africa. The Horn of Africa is a large extension of land that protrudes from the eastern edge of the continent of Africa, lying between the Indian Ocean to the east and the Gulf of Aden to the north, jutting for hundreds of kilometers into the Arabian Sea. Overall, the Horn of Africa is estimated to consist of over 772,200 square miles, most of which boasts a semi–arid to arid climate. Despite difficult living conditions in many parts of the region, recent estimates put the population of the region at about 90.2 million. In a more general way, the term "Horn of Africa" is also used to define a political region that consists of Djibouti, Ethiopia, Eritrea, and Somalia. Some definitions also include the states of Kenya, Sudan, and Tanzania. 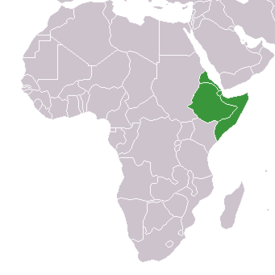 The Horn of Africa is considered a subregion of the larger region known as East Africa, and is sometimes referred to as the Somali Peninsula. The Horn of Africa is primarily distinguished through a low lying arid plain called the Ethiopian Highlands, which is divided into two sections by the Rift Valley. The two distinct sections of the Ethiopian Highlands form an area previously rich in natural resources. While this area once proved a great attraction for explorers looking for frankincense and myrrh, the potential of the area has decreased in recent years. Only 5 percent of the original habitat of the Horn of Africa is intact, a fact which most environmental scientists attribute to overgrazing. While the habitat and plant environment has changed dramatically from its original state, the Horn of Africa continues to contain a high level of native plant life. Currently, the Horn contains a large amount of heather, erica grass, and the small yellow flower commonly referred to as St. John's Wort. Unique to the region are the Bankoualé palm and the native cucumber trees of the Socotra Islands. While much of the area is semi–arid or arid land, the Rift Valley has punctuated the landscape with mountains and ranges. The most notable range in the region is the Simien range, one of the largest mountain ranges in Africa. This range offers a wide variety of challenges for mountain climbers and hikers, including the daunting peak of Ras Dashen. Ras Dashen is the largest mountain peak in Ethiopia, and the forth tallest in all of Africa. The range also remains snow–capped throughout the year, an unusual occurrence on the African continent. The Simien mountain range shelters much of the wildlife for the Horn of Africa, particularly predatory animals and birds that would not be able to survive in the plains. Notable inhabitants of the mountain range include the endangered Ethiopian wolf and roaming bands of Gelada baboons. Among species of birds, the Lamergeyer species of vulture often gains recognition for its wingspan, an impressive feature that can span almost 3 meters. While the mountain range provides shelter for endangered species, the plains offer a harsh existence for animals who choose to make their home outside of the protective mountain folds. 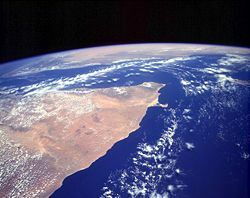 Overall, the Horn of Africa is extremely rich with animal life, hosting a population of over 220 species of mammals. While many animals make the region their home, the landscape and harsh climate combine, creating a difficult environment for animals to prosper. Particularly threatened in the region is the antelope population, which includes such varieties as the beira, the dibatag, the silver dikdik, and the Speke’s gazelle. 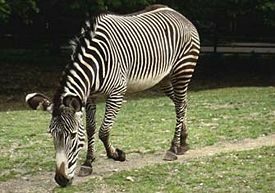 Unique to the region is the Grevy's zebra, which is the largest of all the zebra species. In addition to animal and bird life, the Horn of Africa is home to proportionately more native reptiles than any other region on the continent. With over 285 species, the Horn also contains an extremely high number of native reptile species endemic to the region. Despite the high numbers of reptiles, however, amphibians are poorly represented in the animal life of the region. Access to a water source is a pressing motivation for plains wildlife, as much of the Horn of Africa receives very little annual rainfall. Exceptions to this rule are found in the west and center of Ethiopia and the most southern region of Eritrea, where annual rainfall is boosted by heavy precipitation during the monsoon season. Many developed areas in the region rely on the runoff from the Simien mountain range as a source of water throughout the year. The Horn of Africa became a major center for trade and commerce around 500 C.E., mainly due to the fact that much of the civilization of Yemen began to migrate to the Ethiopian Highlands. The new immigrants to the region formed a city called Axum, which would later become the nexus for the kingdom of Ethiopia. Axum was primarily a trade city, whose location capitalized on the trade routes that led into the interior of Africa. A major commodity traded along these routes was ivory, an elephant byproduct that was highly prized throughout the world for its aesthetic value and rarity. Axum became a major center of trade for the Greeks, who sought the riches of the African continent by forming a relationship with the Axumites. In fact, the Greeks were so involved with the elephant hunting trade in the Horn of Africa that the Greek language was occasionally used on official state documents. Once Axum had gained autonomy and was a formidable political power in its own right, it became center of a series of expansionary wars. The most famous of these is the War of the Elephant, which is chronicled in the Koran. The power and authority of the kings of Ethiopia revolved around a claim made by the royal powers that all kings could trace their lineage back to the great King Solomon. Other important exports of the region included frankincense and myrrh, both luxury goods that were highly valued in classical antiquity. Due to the high volume of fragrant substances available for sale in Axum and the surrounding region, the area was known to the Romans as the Regio Aromatica. During the seventh century C.E., Islam began to gain a major following in Ethiopia. While the introduction of Islam tied Ethiopia the the historic Middle East, it also served to separate the area from predominantly Christian European trading empires. Religious tension between Islamic Ethiopians and Christian Europeans resulted in a heightened atmosphere of religious dissonance. The religious conflicts were resolved in 1630, when all foreign missionaries were expelled from Ethiopia. In the seventeenth and eighteenth centuries, Ethiopia did not have a centralized political structure. Many of the successors to the throne were not supported by large portions of the population due to the religious rift between Christians and Muslims in the area. To control the divided population, many of the Ethiopian rulers resorted to autocratic and dictatorial rule. Possibly due to early expulsion of foreign missionaries, Ethiopia was one of the few African nations to avoid colonization during the Scramble for Africa. While many African countries were colonized by European settlers in the early 20th century, Ethiopia was able to remain independent and autonomous. The only exception to Ethiopian self rule was a brief occupation by Italy between 1936 and 1941. In 1974 a military coup d'etat allowed Lieutenant Colonel Mengistu Haile Mariam to rise to power as the new head of state in Ethiopia. His 17-year rule was marked by extreme civil unrest and complete economic collapse. Many political analysts blame his failures as a leader on his attempts to realign the capitalist Ethiopian economy along the lines of Marxism. The Communist leadership of Ethiopia was eventually overthrown by the Ethiopian Peoples Revolutionary Democratic Front. Complete collapse of the regime came in 1991, immediately followed by attempts to move Ethiopia towards a more Democratic political system. A major step toward this goal was completed in 1994, when the Ethiopian constitution went into effect and set up a system of bicameral leadership. Despite the recent political strides in Ethiopia, the Horn of Africa as a whole has faced devastation in the recent years. Many of the religious conflicts in the region continue to remain unsolved, particularly the tensions between Christians and Muslims. In Somalia the religious tension was a major cause of a devastating civil war in 1977. Other prominent civil wars in the area include the Sudanese Civil War and conflicts in Djibouti and Eritrea. The natural environment has also made life challenging for the predominantly rural Horn of Africa. Major exports of the area, including coffee, bananas, and livestock, have been threatened by recent droughts while floods have damaged the region's natural resources. The environmental onslaught has forced much of the population into poverty. The Horn of Africa continues to have some of the world's highest malnutrition rates and is a constant focus for humanitarian crusades. Oliver, Roland, ed. "The Kingdom of Axum." The Dawn of African History. London: Oxford University Press, 1961. Thompson, L. A., and J. Ferguson. "Eastern Africa and the Graeco-Roman World (To A.D. 641)." Africa in Classical Antiquity, Nine Studies. Ibadan, Nigeria: Ibadan University Press, 1969. Conservation International. Horn of Africa. Biodiversity Hotspots. Retrieved October 13, 2007. Laszlo, Cseh. Simien Mountain. SummitPost.org. Retrieved October 13, 2007. United States Institute of Peace. Terrorism in the Horn of Africa. Special Report No. 113 (January 2004). Retrieved October 18, 2007. Wild Frontiers. Ethiopia Northern Historical Route and Simien Mountains Trek. Retrieved October 13, 2007. History of "Horn of Africa"
This page was last modified on 14 January 2018, at 15:50.